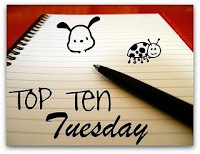 Top Ten Tuesday is hosted at The Broke and Bookish with a new list subject every Tuesday. This week’s top ten is Top Ten Books I’d Like To See Made Into Movies. I love adaptations of things, books, movies, graphic novels, and games, even when there’s always the possibility that they’re going to stuff it up. I love to see someone else’s interpretation of the characters, scenery, or something else because really that’s what it is when someone adapts something – interpretation and in some cases inspiration. I find myself thinking about books being turned into movies with so many of them, and vice versa, that I think my main problem is going to be trying to cut it down to ten! The Queen of The Damned by Anne Rice – I know there’s already a film, but I think QOTD & Anne Rice fans can appreciate my inclusion of this one because it was the worst adaptation I’ve ever come across and I like to pretend it doesn’t exist. I would love a real movie adapted from this story, one that not only follows the plot and the back story, but also captures and enhances the characters. Not a film pretending it’s going to be based on the story and instead ends up mocking the whole concept because it’s too busy trying to look cool and appeal to I don’t know what audience! The Hobbit by J.R.R. Tolkien – I know this is something that is meant to be in the works, but come on, hurry up! I can’t really watch LOTR anymore because of it’s corniness so I reserve it for when my brain is completely fried and I know I will fall asleep, but I still want to see some more Tolkien on screen. His books can be hard to get into, but I think once you get used to the language it gives a pretty lush imagery that I would love to see made real. The Painted Man by Peter V. Brett – I read somewhere that movie rights had been purchased for The Painted Man (U.S. – The Warded Man), but who knows if that is really true? I would love it to be true. I’d love to experience that whole concept visually and I think it would make an excellent dark fantasy movie. Memnoch by Anne Rice – This is an absolute favourite book of mine and I would be interested to see how it could be adapted to the big screen, if they could bring across all the emotions that Lestat and Memnoch go through. Skin Hunger by Kathleen Duey – I’m always craving a good dark fantasy film, but I find that they’re hard to come by. I think this is why I keep going with fantasy and why I’ve chosen Skin Hunger. It’s a dark and engrossing story that I would love to experience in both book and movie formats. That and I think it would be great to see a YA novel brought to film that isn’t all about love triangles and humans fawning over supernatural creatures that you’d expect to rip them to bits. The Witch of Cologne by Tobsha Learner – More of a historical fiction piece, I would love to see this because it has a strong female character and I don’t usually come across films with strong female characters in a subject that actually interests me. It helps too that it involves Holland. Sunshine by Robin McKinley – Not your atypical paranormal romance going by what’s popular these days and all the better because of it. There’s people and vampires, but the people are actually scared of them. Imagine that! I really enjoyed the story and would love to see it both adapted and expanded. Chasers by James Phelan – A book I have mentioned several times on this blog. So much so that I feel like I’m turning into a broken record, but I haven’t said yet if I’d love to see it adapted! I would love to see it adapted because I like movies a little more…. I can’t say because it will ruin the book. Yep, it’s one of those books. Satan Burger by Carlton Mellick III – I would love to see this in film format purely because of the ideas Mellick comes up with and it would highly amuse me to see some of the things that are described in the book. Some of it might be sick, but what can I say? I have a weird sense of humour. The Name of The Wind by Patrick Rothfuss – I put this last, not because I want it any less than the others, but because this would be the ultimate adaptation for me. I don’t think it would work out well because there’s so much detail and the book is pretty lengthy, but I would still love to see Kvothe brought to life on the screen. Believe it or not I struggled with that list and not in the cutting down way, but trying to think of enough! I didn’t think that would happen. So, have any books you’d like to see adapted? A good point on your number ten list. It is often too diffiuuclt to translate a book with heavy dose of details into a movie. I quite enjoyed Chasers and I think that would actually make quite a good movie too! Eerie, the idea of being all alone in a city like New York! I absolutely agree that Sunshine would make an awesome horror film. Great choice! I’ve read Queen of the Damned but have not seen the movie. Sounds like it was a good one to miss. I’m sure Anne Rice would love if it could be re-done well. I’m really curious to read The Name of the Wind, Skin Hunger and Memnoch now. Intriguing choices! The Name of The Wind is excellent and I highly recommend it. It’s fantasy, but doesn’t give into a lot of cliches. I’m going to re-read it soon because his next book came out last month, so I’ll probably have a review of it. QOTD was a shocker. I can’t remember much detail except Lestat’s hair was the wrong colour and in the movie Marius is his maker. You weren’t missing out on anything. They did such a good job with LOTR that you can’t help but hope that they’d do a good job with Hobbit. Hope. Key word. Here’s my post for today’s Top Ten Tuesday. I agree and I’m glad Peter Jackson has a hand in this one too. Surely if the same guy is doing it, it had more of a chance of going well.